EPIC SANA Algarve Hotel is situated in a prime location within walking distance of the stunning Praia de Falesia beach. Its 162 rooms, 24 suites and 43 spacious apartments, which draw inspiration from the beautiful surroundings have been finished to the highest spec and include private terraces and state-of-the-art technology. In addition to five outdoor swimming pools, three restaurants, an indoor pool, a multi-purpose sports field and a kids clubs, the resort also boasts an Oriental inspired spa that features nine treatment rooms and an extensive menu of treatments and therapies. Wellness retreats available to guests at EPIC SANA include fitness, detox, yoga and mindfulness programmes that run for either five or seven nights and in some cases include personalised meal plans devised by a nutritionist. Includes transfers, accommodation & programme. 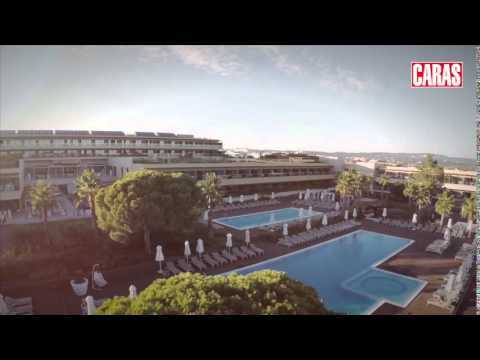 EPIC SANA Algarve Hotel features 3 different areas: the main hotel building, the apartments and the suites. There are 162 rooms, 24 Resort Suites and 43 spacious Apartments with a modern design, complemented by contemporary amenities and state-of-the-art technology. All rooms include king-size or twin beds, 40-inch LED TV with 40 digital channels and video on-demand, coffee machines, hair dryer, safe box and free Wi-fi. Taking inspiration from holistic Oriental treatments, the spa has 9 treatment rooms including a Vichy shower room, massage rooms and a beauty parlour with outdoor terraces, 2 tents and an outdoor pavilion with garden for treatments for couples, a private jacuzzi and fantastic views over the Atlantic Ocean. There is also a sauna, Turkish bath and an indoor swimming pool. The Fitness Centre has a gym with state-of-the-art cardiovascular and bodybuilding equipment. The aerobics and yoga classes are held in a purpose designed room. Sayanna Massages: Kaori-Relaxation (relaxing), Deep Kincho (muscle health) Heddo (physical, mental and emotional balance), Hara-Shiatsu (muscle health), Tsue Bambu (improve blood circulation), Pindas Bags (physical, mental and emotional balance), Hot Stone (relaxing), Ashi Reflexology (relaxing), Zentai Crystal (mental & emotional balance), Kawai-Mum (relaxing) , Teen Kodomo (relaxing), Vichy Relaxation, Petal Immersion (detox), Thermal Immersion (detox), Relaxation for Two (physical, mental and emotional balance). Sayanna Face: Moisturising, Purifying, Regenerating, Botox Effect, Gold Facial, Champagne Facial, Men's Facial. Sayanna Body & Soul: Anti-Cellulite, Scrub Treatments, Anti-Sagging Treatment, Stretch Mark Treatment, Capillary Treatment, Hikari (Lymphatic Drainage). EPIC SANA Algarve Hotel boasts three restaurants and three bars. The resort’s main restaurant, Abyad serves a mix of international cuisine that is prepared using only the finest local produce. Al Quimia is a gourmet restaurant serving contemporary Portuguese dishes from a seasonally designed menu. Located beside the swimming pools, Open Deck serves some of the freshest fish and shellfish caught locally on the Algarve coastline. EPIC SANA Algarve Hotel, overlooking Praia de Falésia beach, stretches over 8 hectares of pine forest and gardens, making it the perfect choice for beach and countryside lovers. The resort is just a 10 minute drive from Albufeira and approximately 30 minutes from Faro airport. I really enjoyed my stay at Epic Sana Algarve. The rooms were beautiful, lovely staff and helpful, and the food was delicious. We enjoyed our 7 nights Bootcamp with great classes and sessions and had an excellent support from the personal trainer and the nutritionist. Take advantage of the great spa on site and The Fitness Centre. We’ll definitely be returning next year. This is an amazing place for a fitness retreat! Very welcoming environment and very supportive staff. I would recommend the Epic Sana bootcamp to anyone who is already active but wants to improve their shape. I had a specifically tailored diet plan and access to all the wellness treatments, which was a really good combination of fitness with well-being. At the end of the fitness programme I felt a million times stronger and now I'm on a total bootcamp kick! Thank you Healing Holidays for organising my trip to Portugal and for all the preparation prior to the fitness retreat. Fantastic trip! I lost 3kg, and my whole body is more toned. I'm stronger and motivated to keep going. The hotel, food and staff were fantastic as well! I have never been on such a holiday before and wasn't sure what to expect. Well, it was incredibly well organised, very soothing and completely stress free. The hotel was wonderful. From the minute the taxi approached the drive, I knew I was in for a treat. The space, light and calm are such striking features that I immediately felt more relaxed. The outdoor space is landscaped with style and in keeping with the location. Areas around the pools are amazing. Everything from the bedroom, bathroom, house keeping, activities, food, service oozed luxury, great attention to detail and utter relaxation. Direct access to the beach was unbelievable: the view from the top was incredible. A 2 minute walk and here I was: on a vast sandy beach. I was incredibly lucky with the weather and spent most of my spare time sunbathing, either on the beach or by the pool. The staff at the spa were highly professional. So were my instructors, Pedro, Juan and Patricia. It is an amazing hotel. Perfect for a healing holiday. Avoid the school holidays where possible as Epic Sana is popular with families. Book any Sayanna Wellness Retreat by the 30th April 2019 and receive a 20% discount. *Valid for stays in May 2019, June 2019 and July 2019. T&Cs apply. Physical exercise combined with a balanced diet is the key to a healthier life. Choose the program according to one of two goals: weight loss or improvement of physical condition. "AMAZING! Especially that they call there clients!!! I think in our digital World of emails and Watsaups...it is sooo sweet to here for a Real human voice!"